E3 is one of the world’s biggest gaming shows and arguably the one with the most fanfare and attention from industry watchers. All the biggest game publishers make their biggest announcements of the year at E3, and many of their developer and hardware partners do as well. So naturally, E3 is a generally important show for the entire industry, and this year’s show was the first time that the show was open to the general public. That created a new level of hype around the show, however, much of the focus around this year’s show was about new platforms, namely the Nintendo Switch, PSVR, Xbox One X and VR. Microsoft had its Xbox press conference where it announced the Xbox One X, previously codenamed the Xbox Scorpio. Microsoft put the Xbox One X at the top of the ‘Xbox One Family’. Prior to the show, Microsoft gave an interview with Polygon where it said that it will talk about VR on the Xbox later. I believe that this was a major mistake on Microsoft’s part, because during the press conference Microsoft only mentioned the word VR once and left many watchers and fans confused. After all, when Project Scorpio was announced only a year ago at E3 2016, Microsoft touted a high-fidelity VR experience on the Xbox and then proceeded to say nothing about it. I believe that this mistake may be a result of Microsoft’s own internal corporate politics and the fact that Microsoft is launching its Windows Holographic headsets this summer, and those VR headsets are focused on the PC. I believe that this will impede Microsoft’s work on Xbox VR and put it further behind the competition like PlayStation VR unless it can leverage PC and console together as one. Ignoring the VR flub, Microsoft has an uphill battle with the Xbox One X because of the $499 price, even though in my opinion you will not be able to build a new comparable PC with that kind of performance for $499. Additionally, Microsoft is still selling the PC platform as the pinnacle of gaming performance and experience, so it kind of has a conflicting message where it tout the PC as the high-end but also offer a high-end console at $499. All mistakes and pricing aside, the Xbox One X really is the first piece of hardware I can think of that genuinely would make someone go out and buy a 4K HDR TV. Except for Netflix and Amazon Original titles, there really isn’t much 4K content out there let alone 4K HDR. Microsoft may end up leading the charge with 4K HDR because of the Xbox One X, but we will see how many it can actually sell at $499. Sony’s PlayStation conference was extremely focused around PlayStation VR and getting new titles to the console with some being ported from PC. Sony showed tons of new games in addition to the ones that are already announced and coming out this year, including some completely new IP. Superhot and Arizona Sunshine are both titles that are coming from the PC that are being ported to PSVR and will make for great VR games on PSVR as well. Some other titles include Star Child, which is a completely new and made-for-VR from-the-ground-up title. There are other titles like a Final Fantasy XV spin-off specifically made for VR, which is an RPG, and another RPG is simply called Moss and looks like new IP made specifically for VR. Other titles like Bravo Team and The Impatient look to further broaden the portfolio of games available for PSVR and create quality AAA-level content for VR. Bethesda also committed to launching both Doom VFR and Skyrim VR on the PlayStation VR platform, with Sony getting a timed exclusive on Skyrim VR. Sony also pledged to restart promoting the PSVR now that it is ramping production to meet demand, which should come to a head around the holiday season. In addition to the Xbox and PlayStation announcements at E3, there were also a lot of announcements for the new Nintendo Switch. While the Switch is not VR capable like the PSVR or Xbox One X, it does present a new type of gaming paradigm where a device can be used for docked or mobile gaming. 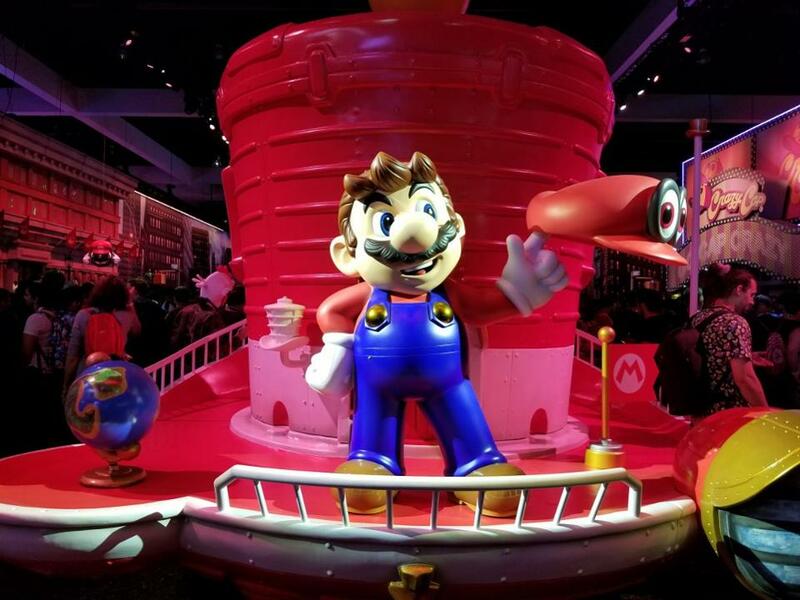 At E3, Nintendo announced that it moved up its flagship Mario Odyssey title up from its originally announced date, getting lots of fans excited. Additionally, EA announced that the anticipated Nintendo Switch version of FIFA 18 will be a nearly fully featured version only missing the story mode from the other console versions. Bethesda also announced that the Switch would be getting Skyrim, which was kind of already known and represents the Nth time Skyrim has been ported to a platform. The developers of Rocket League also partnered with Nintendo to announce that Rocket League will be coming to the Switch and will be cross platform with all the other platforms that already have Rocket League like PC, Xbox and PS4. Nintendo also announced some new IP for the Switch including a new Kirby game as well as a Pokemon RPG title, which is the first full Pokemon title for the Switch. It also announced a new Yoshi game for the Switch which shows that Nintendo is finally using the full force of its IP portfolio to both sell games and encourage new Switch sales through the next two years. Lots of new VR hardware and content was announced for all platforms, including the Xbox One X even though Microsoft didn’t explicitly state it. Dell and Alienware also announced new gaming VR PCs including a new Alienware Area 51 with an AMD Threadripper 16-Core processor and a new more affordable Inspiron Gaming Desktop based on the new AMD Ryzen. DisplayLink showed off its wireless VR solution, which isn’t an actual product, because DisplayLink is a solutions provider who helps companies build products with their chips. Wireless VR really promises to be a major trend in the second half of this year, with companies like Advanced Micro Devices (AMD), DisplayLink, Intel and Peraso offering solutions to accessory and HMD makers. OSSIC VR has an updated version of its spatial audio headset for VR and AR and showed off a new VR audio demo that I got a little too into. Also, as previously mentioned, Bethesda showed off Doom VFR and Skyrim VR for PC and PSVR, and I expect that we will continue to see more VR from Bethesda down the road. Ubisoft also announced some of its own AAA VR titles including Space Junkies and Transference which show Ubisoft’s ambition and continued commitment to VR. After all, Ubisoft has been the most aggressive publisher in my opinion for VR and has consistently created some of the best titles to date. The still-in-development Gameface VR headset based on Android announced that it will be adding SteamVR tracking support which will give its headset room-scale capabilities and better tracking. Nintendo also announced a Mario Kart GP title for VR arcades only, but that shows even Nintendo is investing in VR. E3 focused on new platforms, and many of these new platforms were focused around VR, which means we have yet to get an idea about the success of VR. Nintendo is focused on the Switch and bringing as much of its own IP to it as possible while also enabling 3rd party developers. I believe that Nintendo really has a winner with the Switch and will be able to make up for the weakness of the Wii U. When it comes to all these new platforms there’s lots of new content with a fair share of that content being focused or ported to VR. However, we still haven’t seen any ‘killer’ VR apps, yet, but the content is clearly maturing with many 1st time VR developers now creating their 2nd or 3rd titles. This year’s E3 seemed much less about the hype of VR unlike last year and more about how to understand VR better and to make better content that’s focused on VR. Whether it’s hardware or content, people seem more focused on delivering better and more thoughtful experiences, even if the market still hasn’t grown as fast as many would like.